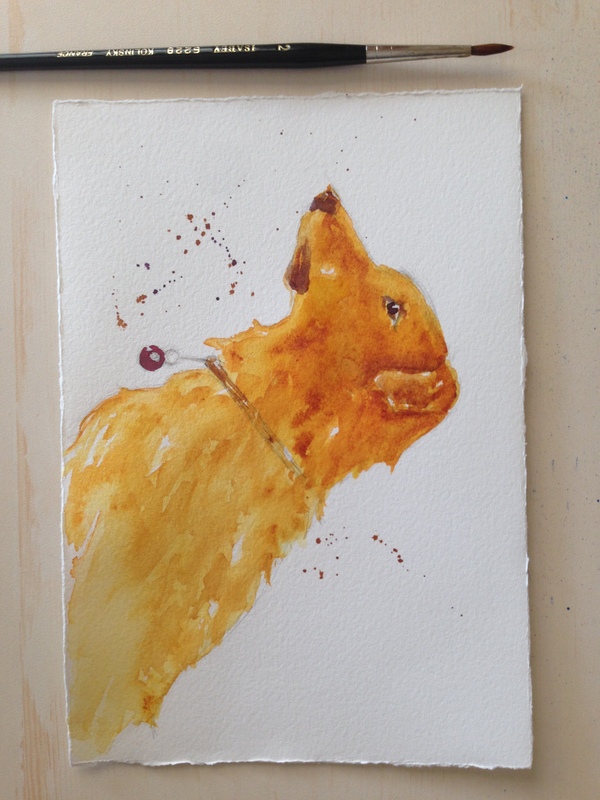 This one started out as an abstract silhouette of a dog, in a similar fashion to the cat I painted yesterday. But as I started dropping in color to the damp paper, I was getting shading kind of similar to the reference image I was using…. so I wound up going a bit more realistic than planned. This is watercolor on 8 1/4″ x 5 1/2″ Arches 140 lb. cold-press watercolor paper. I definitely changed the color from the reference, but not way. Considering that I love drawing animals realistically, but have almost no experience painting them, it turned out ok, and the fur texture sure worked out better than I could have hoped. However, looking at the work of Rebecca Evans and others here on WP who paint animals so convincingly, let’s say I’m not where I need to be, but I’m making the journey. Do check out Rebecca’s blog, she will inspire and impress you with horses, hares, and everything furry and hairy under the sun in almost every medium there is! An extremely talented artist, and a good woman, to boot! I was pleasantly surprised with the performance of my #2 round Isabey sable brush, which definitely helped me get my furry on. It was pretty much a matter of flicking here and there in the direction the fur was growing on damp (not wet) paper. Using M. Graham’s wonderful Nickel Quinacridone Gold paint seemed to help a lot too; just the nature of the pigment gave me a hand up. Which I needed! Not sure I’ll be trying any more realistic animals in watercolor soon, but this turned out better than I could have expected with a semi-realistic animal painting, for sure. Boy, lots of practice with watercolor this month! I hope you’ll join us; it’s never too late to pick up a watercolor brush and fling paint (and joy) to the moon! Peace. It’s wonderful to know that our watercolor adventures are full of ups and downs, jackpots and mistakes. But in the end, we only win and learn and improve. Planned or semi planned, that dog is still awesome! Thanks so much, Rebecca! You know you inspire me, girl! I appreciate your tip re the layers, would you have hard edges in that final layer, using a rigger type brush? Thank you, Denis. That is very kind of you. I appreciate your words very much! Thanks so much, Kerfe. I tend to think my WC animals look kind of flat but I’m trying to improve. I appreciate your feedback, as always. Oh I don’t think they are flat at all! Thank you so much! I’m enjoying your blog as well! Love your title. Bluebirds are my favorite of all of them! Thank you and the same to you! Is your bluebird there an unretouched photo? It’s pretty amazing! It’s really unique and beautiful too. Hugs back! Yellow dogs make me happy! Look how AWESOME it turned out! It is loose, but not too – and splatters always make it just a bit better – hehe! LOVE LOVE LOVE it! Rock on Artista Sista! Yup but after kinda wrecking the cat, didn’t wanna demolish the dog too lol. I love how you give personality to your animals. Thanks, Laura. I try to focus on the eye, which usually helps. You are really good at painting dogs! I did check out Rebecca’s site and loved her dog paintings too! Your dog is so beautiful. His fur is so realistic, that I almost feel that I could pet him. Love it! hmm……in the past couple of months, I have changed from late to early rising too! *tapping my fingers on my temple* maybe there’s a correlation lol. ❤ All kidding aside, I love how you relate to the medium, it's a real joy to watch. thank you Laura 🙂 so much! Adorable! A lovely companion for yesterday’s cute kitty – I bet they look gorgeous side-by-side – now we know who he was looking out for! Thanks so much, Charlie! I’m really glad you like it. Trying to get my furry on, bro! 😀 I’m still drawing in pencil daily to get my fix – and to come closer to my reference image, haha. So lovely! Oh yes Rebecca’s work is a greatest inspiration 🎨Cheers! Thanks, Snehal! Trying to get my furry on lol. Awesome dog you got there! Thanks, Sissh! It’s a journey but I’m trying. I feel like animals and maybe people are my thing – when working representationally, anyhow. Love! What else can I say? Way to go girl, you rock!! You’re way too kind, Susan but thank you very much! Really glad you enjoyed this! that’s a fabulous dog, Laura, and it looks realistic to me! Thanks so much, Tom! I feel I have a lot to learn about fur but I really appreciate your feedback. Lovely painting, the twists and turns of a watercolor journey are delightful. getting your furry on; oh my gosh! thought I’d start gasping with laughter! I do love the golden fur, the face and the Fun you had with it! its true, too, do just about anything everyday for a month and it will get easier 🙂 now, I need to go see the kitty!